Why Is Freediving So Popular? 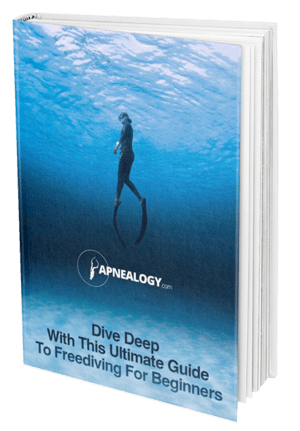 Download our FREE eBook guide and discover why freediving is so popular and how to get started! Spearfishing is a great sport that allows you to get in a good workout, hunt, and be surrounded by marine life. However, you don’t want to go diving with just any old pair of fins because if you choose the wrong fins, you could wear yourself out quickly and possibly need to cut your diving trip short. 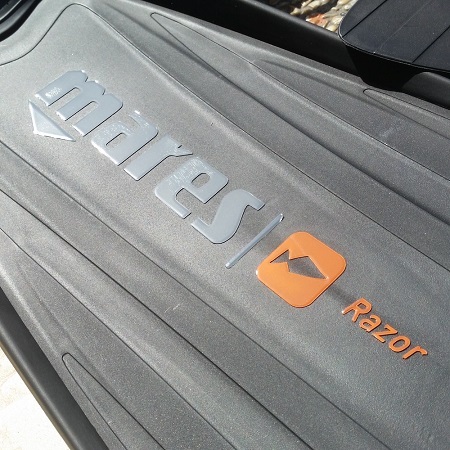 Today, we’re going to help you out and review the Mares Razor Pro Spearfishing Full Foot Fin. In our review, we are going to highlight the features of these fins, but also give you a summary of what customers had to say about their experience using these fins. At the end of our review, we’ll give you our recommendation on whether these fins are worth considering or not. The Mares Razor Pro Spearfishing Full Foot Fin is a long blade fin that features an interchangeable fin. The fins were designed in collaboration with a top foot clinic in Italy and the result is an ultra-comfortable pocket that provides support for your arch, while the blade converts the energy you exert into powerful forward propulsion. The blade of these fins features varying thicknesses that will bend while you’re swimming. This means that you’ll achieve the perfect flexion curve, thanks to the techno-polymers used to make the blade. These polymers promote agility and elasticity that’ll make a huge difference when diving. You’ll find that the blades feature channels and there are lateral stringers on the foot pocket, and these two features work together to help move water flow toward the V-tip at the tip of the blade. The V-tip helps to increase the thrusting power while preventing the fin from lateral slipping. When looking at what people had to say about the Mares Razor Pro Spearfishing Full Foot Fin, we noticed most of the reviews were positive. Of these positive reviews, customers felt that these blades were pretty good for those just getting their toes wet (no pun intended) with spearfishing. They went on to say that these fins were a good alternative to more expensive carbon or fiberglass blades because they are stiff enough to give you good thrusting power without causing you to use a lot of energy. Customers also like that the foot pocket is made of a comfortable, good quality rubber. They like that because they are made from rubber, the fins are easy to remove the blades. Several people have mentioned they’ve dived with these fins many times and the fins are still holding up without any cracks or breakage, even when diving from rocky shores. People commented that these fins do move a lot of water, which helps them to reach deeper depths without needing to use a lot of muscle power to propel themselves forward. While many customers did have great things to say about using these fins, there were a few people who had a few concerns. The most common issue people had with these fins was that the sizing is very off. Many customers reported that they needed to size down a full size because the pocket was just too big. One customer said they typically wear a 10.5 men’s sneaker, but they needed to purchase a size 7/8 fin. To get a good fit, this person also recommends wearing a 3mm neoprene sock. A few people mentioned that when sliding the blade out of the tracks, they had a really hard time sliding the blades back in. One customer reported needing to twist and push the blade in, and even that was a challenge. They went on to say that the slides for the blades would fold in on themselves when you’re trying to push the blade in, thus making the whole experience frustrating. Also, some people have had problems with the tips of the tracks splitting only after a few years. 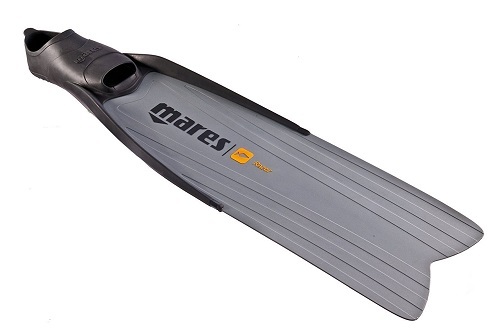 The Mares Razor Pro Spearfishing Full Foot Fin are designed to be used for snorkeling and much more. Since these blades are long, lightweight, and on the stiffer side, these are a great option for both novice and experienced spearos alike. 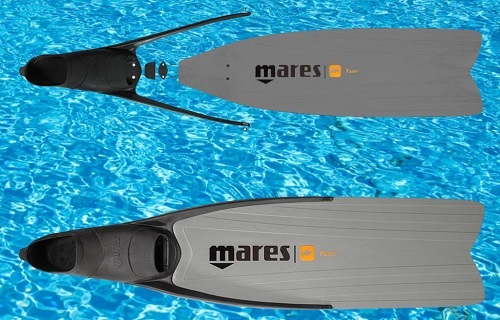 Mares worked in collaboration with a leading foot clinic in Italy to create a fin that will give the user extra support under the arch, while the 22-degree angle of the blade to foot makes the fin feel like it’s just an extension of your leg, thus allowing you to comfortably and easily dive without exerting a lot of energy. We like these fins because the blade features varying thicknesses to allow the blade to bend during the various stages of the fining action. This gives you a perfect flexicon curve that’s at the core of agility and elasticity, thanks to the techno-polymers used in the fin’s construction. Although we think these fins are definitely worth considering purchasing, we do want to mention that the sizing seems to be quite off. This means that to get a good fit, you will want to size down, but also try thin neoprene socks to get a truly snug fit. 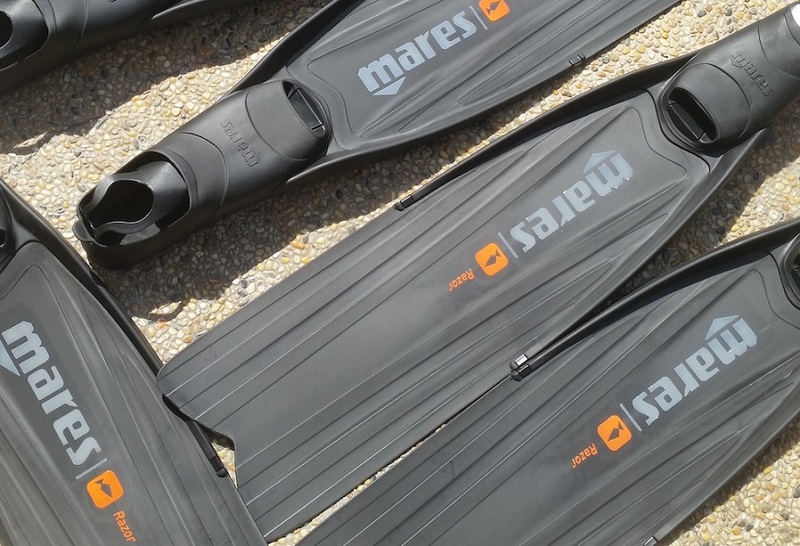 If you’re looking for a great pair of fins that’ll be useful at any skill level, we think the Mares Razor Pro Spearfishing Full Foot Fin are a great option. They’re lightweight and they give you a lot of forward thrusting power with minimal effort on your part.